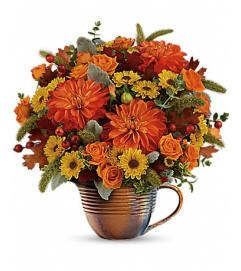 Celebrate fall's wild beauty with this rich autumnal bouquet! 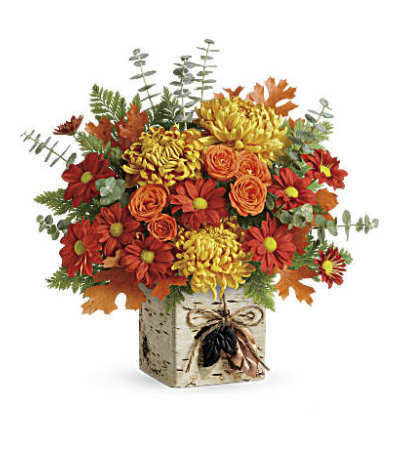 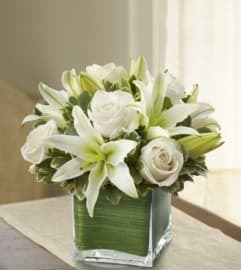 Presented in a rustic cube vase with unique birch tree finish, it's adorned with twine and stamped metal leaf charms, a true gift of the season!This wildly beautiful bouquet includes orange spray roses, bronze disbud chrysanthemums, red daisy spray chrysanthemums, spiral eucalyptus, and transparent orange oak leaves. Delivered in a Wild Autumn cube.VASE This gorgeous birch tree-inspired cube is finished with a tree bark texture with black and copper-colored metal leaf charms on a twine cord, perfect filled with fall blooms or as a décor piece!